IKEA iis mye IDEA uf Helle wit Knobden onn – The Diesel-Electric Elephant Company. Curtains. As far as I am concerned they are dust-laden habitats for arachnids, moths and the wee people who creep out when I’m not in and put smudges across my “television” screen. They may have been the latest thing when Henry VIII was knee-high to the throne, they may be beloved of little old ladies in Godalming on Sea and they may keep the velvet and gold-thread manufacturers of West Dorset in business, but I don’t like ’em. Blinds. The Bro’ and I went to fetch me some from the market. Well, to be exact, we hoofed off in the Bentley to Warrington’s IKEA emporium for some TUPPLUR roller blinds. I chose these because they cost only half a magic bean each and because, hopefully, they will poke out into my narrowboat living space less than the curtains do. IKEA eh? What’s that all about. Just driving through Warrington is test enough of the old motoring cut-and-thrust, and as we navigated pothole after roundabout after traffic light I thanked the Greek and Roman gods that I had remembered to ask the handyman, Sodbucket, to lash an old railway sleeper fore and aft before we set off. 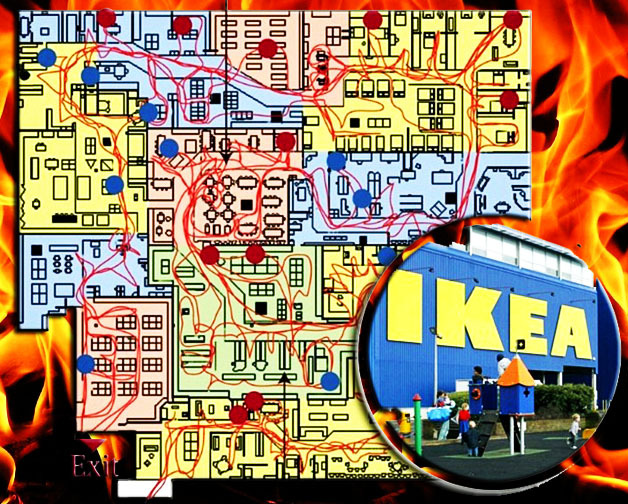 IKEA is buried (rather appropriately, if somewhat inadequately) on (in? under? amongst?) an industrial-retail “estate” or “park” of some kind. Should you ever visit, please do not fall into the trap of imagining that your problems have been surmounted once you find a parking space in some reasonably similar latitude and longitude. Oh no, the “store” awaits. When exactly did the lovely English word “shop” go out of fashion so? In we went, like lambs unto the mint sauce. Well, we were hungry, so the Bro’ headed for a plateful of REINDEER TESTICLEN with gravy, while I fell face first into a dish of VEGETABL BALLEN with FRENCHUN FRIZE (they didn’t do proper chips). Passable enough, since we had neither of us eaten since throwing ourselves past the “Warrington – Twinned with Beirut, Kabul and Milton Keynes” sign. I haven’t been to an IKEA for twenty years, literally. At that visit an ex-SIGGNIFICANTE OTHUR and I found ourselves locked in the great English DILEMMAH when we were one of five VEEHICKELS to arrive simultaneously at a five-way mini-roundabout. After twenty minutes of dithering over whether leather and moustaches held priority over crisp, understated fashions and neater haircuts I solved the problem by simply smiling like a loon and then forcing the BUGATTI PUNTO through the junction. To be BRUTALI honest, I think that everyone was relieved. I knew that there were… RESONS why I hadn’t been to an IKEA in two decades. GUD RESONS. I’d just FORRGOTEN. IKEA make their customers walk past a display of every single ITEMM that they sell. There’s no escape. There’s one way in and two ways out – DEDD, DISKRETELY under a REDD blanket on a stretcher via the mysterious staff doors, or ALLIV under your own steam via the end of the trail. The trail takes ruddy hours. We looked in vain for the SITTEN DOWNEN stations or the SNACKEN BARRS stations and even – some hopes – a FURST AYD station that might have OXYGENN available for two old farts in dire need. All we got was ENDLAS bloody retro fifties faux-Jetson and peculiarly aggressively NORDIK and SKANDINIANSKI taste in boxes, seats, cupboards, beds, pipe-racks and lighting FIXTURS. I had to ASSK how to shop – and to ASSK how to SHOPPE I had to find a MEMBUH of STAF first, and let me tell you, those are as rare as UNIKORN SHITTE. I hope that the voice in your head just said SHITTE with an appropriate AKSENTUH. I KNEWE what I wanted to BUYYE – plain and simple white roller blinds – but to get them we had to walk through an entire display of some MENNY MENNY MIHLES – and then walk through a similar display of the self-same physical, buyable goods – and then carry ELEVVEN TUPPLUR blinds more miles to the CHEKOUTE to PAYY. Once THERRE I found out that the two LED lights that I had chosen on a WHIMME had to be KOLLECTEDD from yet another WAREHOWSE another DRIVE away. Not only had we fetched most of our goods from the fetid belly of the IKEA warehouse, but some we had to drive ourselves to yet another entirely SEPARET fetid IKEA warehouse to fetch! Not big on “customer experience”, eh, IKEA? We were as KNAKERD as though we’d done a FUL DAYZ WURKE, but at least I’d got my blinds. All I have to do now is to fit that darned things. Roller blinds, white, black-out material, made of, four portholes, five windows and two doors for the use of, Sir. Simples, dimples. Oh, and the shiny blue one-way reflective (REFLEKTIVV?) window film has arrived, so there’s lovely for you, Myffanwy, yes indeed. I may soon have windows that meet my needs INSTED of functioning as gawping-holes for the HOY and the POLLOY. Still, MUSTUNT GRUMBBLE. Home safely now, and that’s all that MATTUS eh? SANNITEE INTAKT and all that, GOTT WOTT I needed to get. WONTE be GOEINNG BAK for another twenty years, if at all. This is a must-read! A hilarious account of visiting IKEA. Love it! Hello from across the pond! I actually think Ikea is kind of charming [ducks in case anyone starts throwing eggs or tomatoes or rocks or something.] My husband would be more inclined to agree with you on this one, though, about the size of the store and everything else. He certainly appreciates the dirt-cheap prices, and we own a bed (for one of our daughters,) its matching dresser, and four bookshelves from Ikea. I’m not sure what experience anyone else has had, but the bed and dresser have moved with us cross country twice and held up better than some of the pricier furniture! Never been to IKEA. Now, I never want to. I have a Putter-Together-In-Residence, but he curses so. One of the more “interesting” aspects of the route-march is the way the path twists and turns – I lost any and all sense of direction, there was just no chance of knowing how close we were coming to the exit, it was just a case of walking and hoping! Like the jolly old Hampton Court Maze, what? If I ever venture into an IKEA again I’m going to take an overnight bag and stop somewhere halfway around the shop… possibly a small gas stove and some cooking kit too. I should have paid the delivery charge, it would have been easier! My man took me to Ikea recently to purchase a new dining table. I had prepared beforehand to find the reference number of the item, the position of it in the warehouse etc. We got to the shop and had to get upstairs before I could ask for a wheelchair which turned out to be a nasty unruly thing; eventually found the table in its box then discovered that we should have got an industrial strength trolley before we started shopping! It is not an experience I want to repeat, I found it most depressing and dispiriting; John Lewis is far more friendly and helpful and delivery is free if you spend over £50. Do show pictures of your blinds whan you have hung them. You see men don’t usually shop like us women do; we go up and down every isle just in case that something should grab the eye! Men however usually home in on the one thing they want and go get it! Simple! Unless of course you shop at Ikea – it’s bit on the psychology of shopping and obviously it works. I went once and bought bunk beds, the delivery charge cost me more than the item! Me no go Ikea or Marks and Spencer come to that! I once made the mistake of going in there for a handbag – no handbag section, each bag is displayed with all kinds of outfits across the whole shop. I shop on line now!! !